We operate a Funeral Home based in Huntly and have a profession­al team available for that personaliz­ed funeral arrangemen­t. 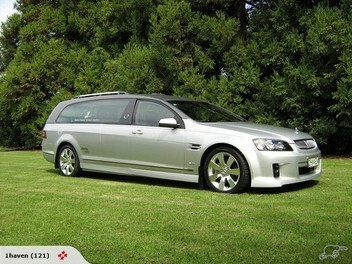 NZ's only Holden VE SS V8 Heritage Hearse for hire for funerals requiring that little something special! Waikato, King Country, Auckland, Bay of Plenty with all other areas considered­. We are proud to offer our 2010 VE SS V8 Heritage Holden Hearse for hire for funerals that require that special point of difference or special touch. This custom built hearse is New Zealand's only VE hearse in a 6 ltr. V8. Finished with all the usual SS features including leather interior this hearse looks absolutely stunning and even sounds like a V8 should. We are based in Huntly and can either just provide the hearse with a professional driver on the day of the funeral or you may wish to engage our full services for the complete funeral arrangements. We could even provide a Holden graphics Styled Casket as well. All other areas by arrangement.